Do I really need a first aid kit? Hate feeling unprepared when something bad happens? We have all been there and it is flat out one of THE WORST feelings. Especially if you are an avid outdoorsman. There is nothing worse that being in the middle of nowhere and not having the supplies you need to deal with a potential emergency situation. Being someone that spends a good amount of time away from the resources of city life, I know the feeling all too well. But does it REALLY matter what first aid kit I buy? Aren’t they all the same? A little background on myself first, which is important to know going into this review. I am a registered nurse, full-time, so healthcare is what I do. In fact, I am downright passionate about it. Healthcare and the outdoors are what I live for, so offering my thoughts on what I consider one of THE BEST first aid kits available is something I take pride in. 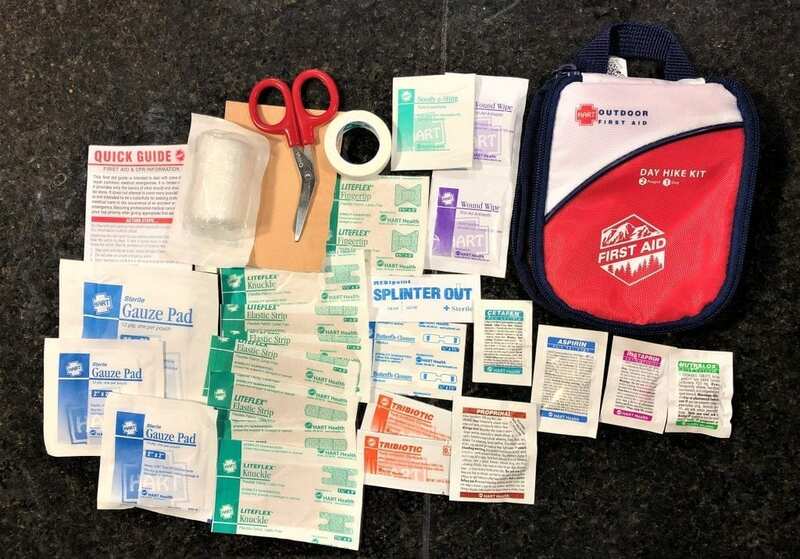 There are so many great first aid kits available, hundreds that I will never see or use, and they are probably REALLY great. With that being said, I am very impressed with what HART Outdoors offers with all of their first aid kits and wanted to share my first hand opinion. If you are one of those people that likes to be prepared for just about anything, this is your kit. This thing is LOADED with just about anything a person would need in a first aid kit. HART Outdoor really did a nice job of packing TONS of useful first aid items into a small pack. Personally, I use this as my “Do It All” kit when I am in need of a highly functional backpacking first aid kit. This thing literally has everything I can see myself needing and then a lot of stuff I hope I never need. I actually feel very well prepared and safe when I am packing this first aid kit. Why I like this First Aid kit….. 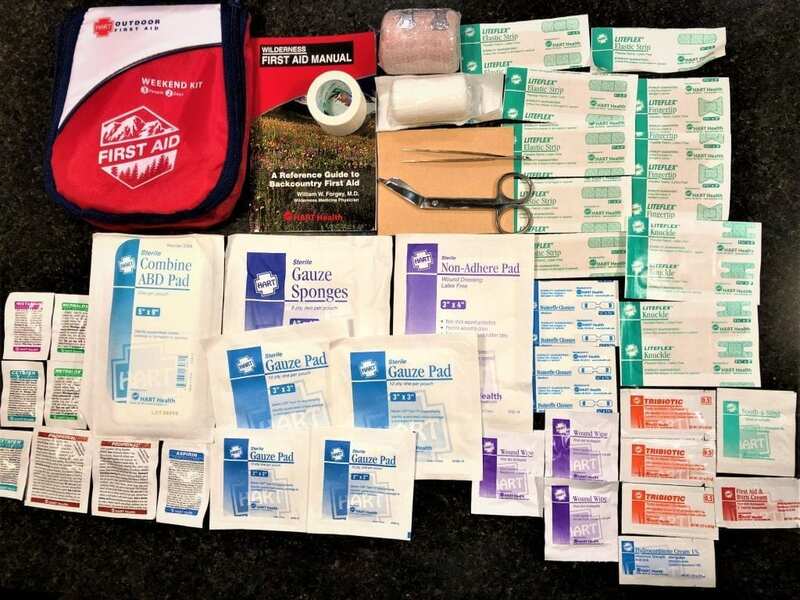 If you ever find yourself in the middle of nowhere in need of a great hiking first aid kit, this is it. 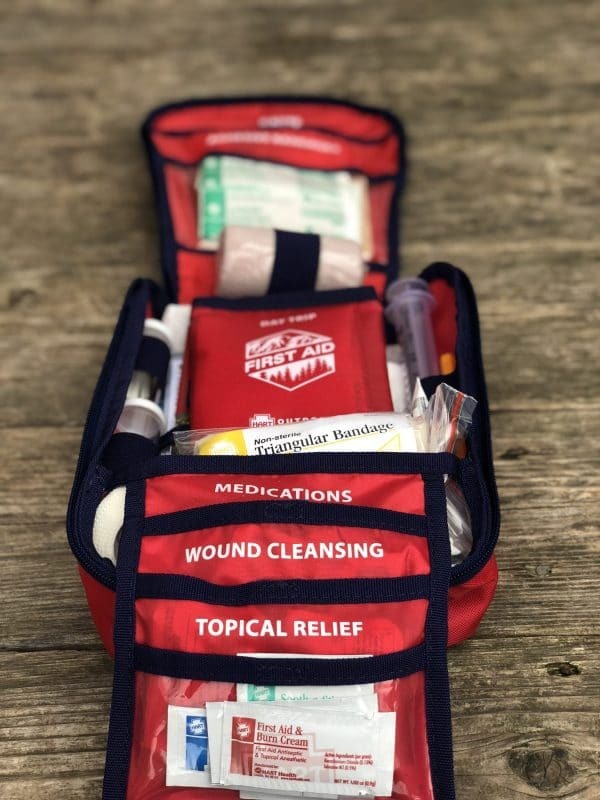 If you need wound care, adhesive bandages, dressing supplies, medical tape, or even something to support a broken bone, this first aid medical kit will do the job. One thing that might get overlooked in the endless amount of medical supplies are the medications. The allergy medication is a nice touch, something I have wished I had far too many times. It’s the little things. I like the Wilderness First Aid Manual that is included for a quick and easy reference for a wide variety of possible situations. There is legit credibility here as it was written by Dr. William W. Forgery, who is a wilderness medicine physician, It offers instruction on what to do in situations as simple as a bruise or as serious as cardiac arrest. Some of the more unique scenarios include : scorpion stings, black widow and brown recluse spider bites, hypotheria, frost bite, heat stroke, seizures, and anaphylactic shock. Again, the Extended kit is really a great backpacking first aid kit, one I know I won’t go into the deep backwoods without. This is a kit that can be appreciated by even the most extreme outdoor enthusiasts. What I don’t like about this safety kit ….. It would have been nice to see their largest first aid kit come with some sort of emergency blanket. It should be noted that this first aid kit may not be ideal for any survival or safety kit situation. With so many pieces, this is more of a backpacking or extensive hiking first aid kit. For example, it may be a little overkill when used as a travel first aid kit, but to each their own. Who this kit is good for…….. 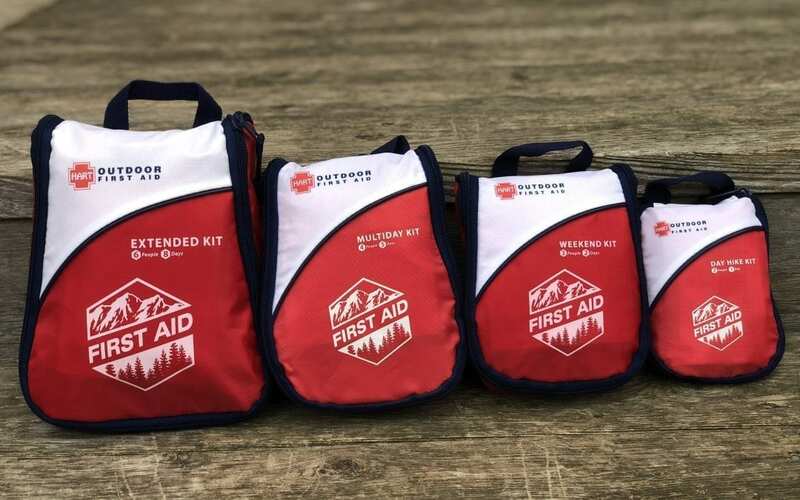 The Multiday first aid kit by HART Outdoor is the perfect kit for anyone looking for a little MORE than a travel first aid kit, but doesn’t necessarily need a kit equipped for spending a month of the grid either. I like this kit when used as a camping or hiking first aid kit. This would also be nice in a travel first aid situation. You could get away with using the multiday kit for extensive off the grid expeditions, however, I like the Extended Kit above for the longer duration expeditions. You get enough supplies to treat most first aid situations multiple times. I CANT STAND when I use supplies out of a first aid kit and then the kit almost seems useless because it’s missing supplies. You can use this for an emergency situation and still have CONFIDENCE to use this kit again. 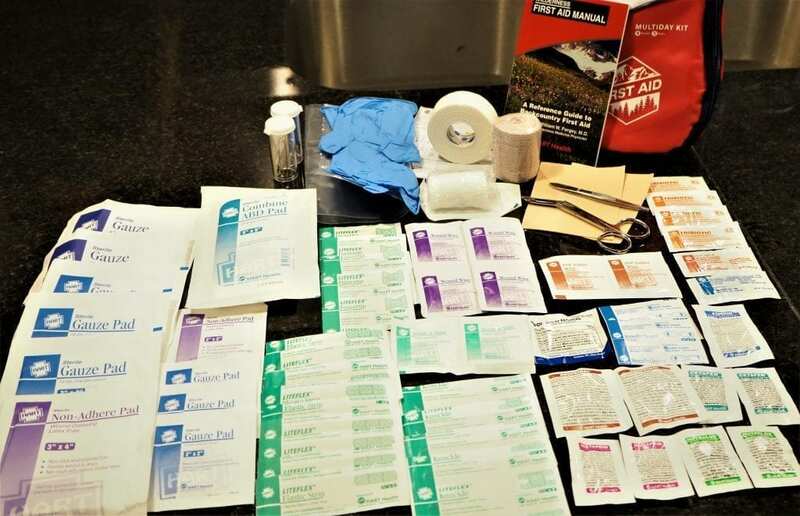 With plenty of bandaids, gauze, antibiotic ointment, and basic wound care supplies, this kit will cover all of the basic wound care situations several times. The medications included in this kit are a nice touch, as you get the basics in allergy relief, antacids, acetaminophen, ibuprofen, and an aspirin. Combine that with the iodine wipes, antibiotic ointment, hydrocortisone cream, and burn cream and you have yourself a really nice kit that covers ALOT of basic medical needs. The scissors and tweezers are also a very nice touch that are not always found in other first aid kits. What I don’t like about this safety kit….. I would have liked to see more than one pair of gloves. With enough supplies to last multiple uses, the one pair of gloves seems a bit short. The Weekend Kit is rated for 3 people for 2 days. You are essentially getting double what you are getting in the basic day hike first aid kit, with the addition of a few extra items. I like this kit when used as a short camping first aid kit, such as a weekend getaway. Personally, I use this as a boat first aid kit. It’s perfect for everything I would need when out fishing. This would also be a PERFECT first aid kit for travel, as it would pack nicely in your car and offers plenty of first aid options. 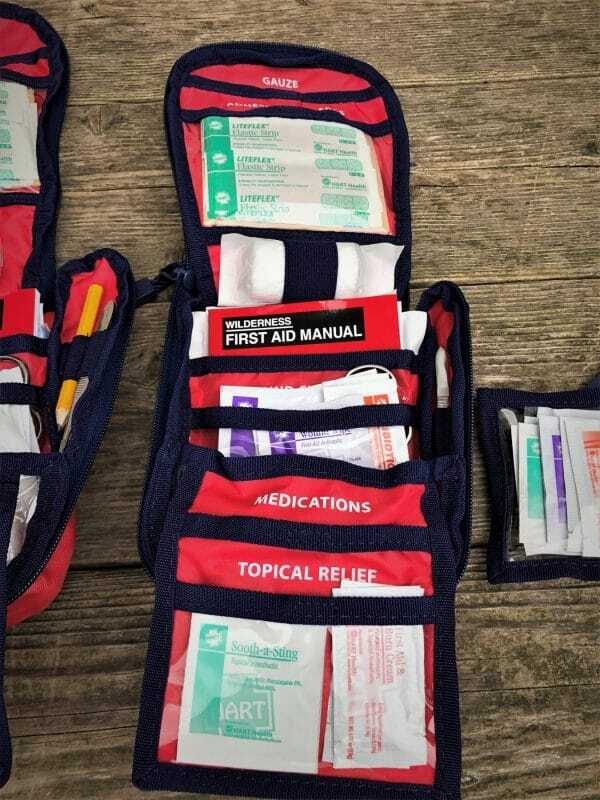 The weekend first aid kit offers a good amount of band-aids, gauze, scissors, tweezers, basic over the counter medications, and the First Aid Wilderness Guide. The guide is a nice touch, giving users a quick reference for a variety of first aid topics. What I like most about this basic first aid kit is contents vs. the size. It is EASILY packed into any small space, pocket, or compartment, making this an ideal travel first aid kit. 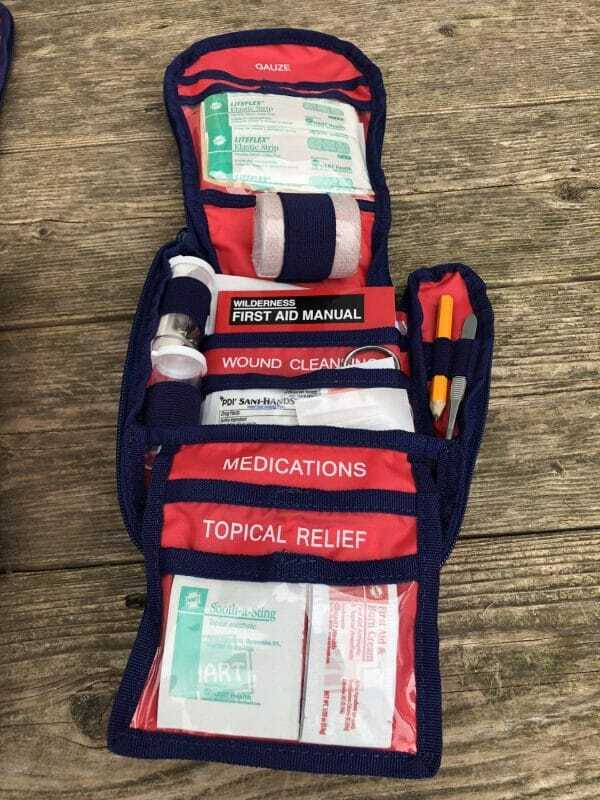 Honestly, this is a pretty well-rounded first aid kit that can be used anywhere from your car or boat to a small pocket in your hiking pack. If I had to be picky, I would have liked to see a pair of gloves included in this kit. Heading out for a quick day hike and don’t have much room for supplies? This is the perfect hiking first aid kit for someone looking to travel light. Equipped with just the necessities for basic first aid, the day hike kit gives you what you need to treat your basic first aid needs. 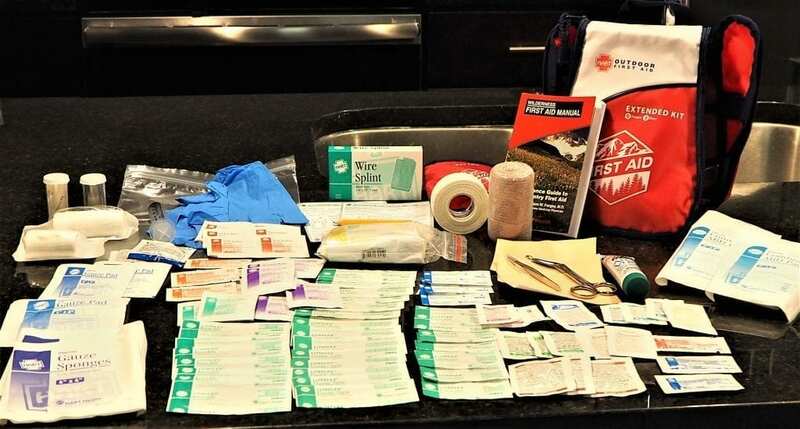 The day hike first aid kit is heavy on band-aids and comes with some very simple wound care items such as: gauze pads, tape, antibiotic ointment, wound wipes, and scissors. The quick guide is a nice touch, giving users a quick guide for basic first aid issues. What I like most about this basic first aid kit is the size. It is EASILY packed into any small space, pocket, or compartment, making this an ideal travel first aid kit. I keep this one in my car at all times as it easily fits into my glove compartment, allowing easy access in an emergency. Also great for hunting packs and fishing bags. It is small, but that is the point. Not ideal for all situations as it is more of a travel emergency kit or for the casual person who enjoys a few hours in nature. I would have liked to see a set of tweezers with this kit, even if it meant sacrificing a few band-aids. 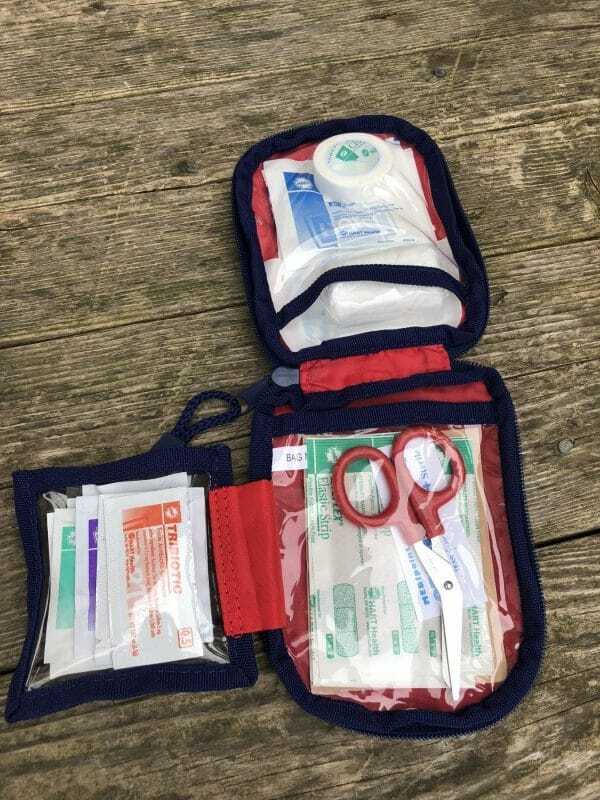 Hope you enjoyed our review of the Hart Outdoors First Aid Kit Product Line. As always, we would love to hear any feedback from you. If you would like to see a specific product review or even see us add to our current first aid kit review, send us an email! Also, be sure to check out our Instagram, Facebook, and YouTube Channel for the latest from RYG. Don’t forget to go checkout the products for yourself at Hartoutdoor.com and REI.com for purchase!